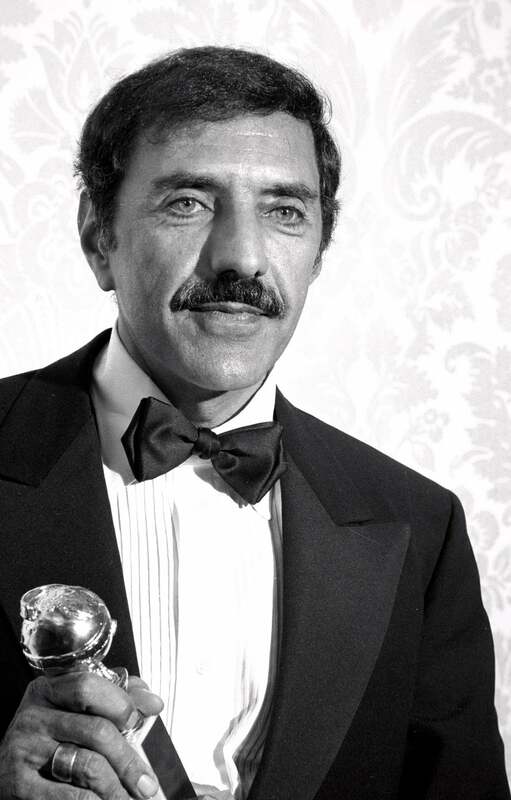 William Peter Blatty with his Golden Globe for Best Screenplay, The Ninth Configuration, 1981. William Peter Blatty, winner of three Golden Globes has died, age 89. Blatty was an author, who also wrote his own screenplays, and produced some of the movies based on them. His religious-horror tale, The Exorcist, brought him his greatest and most lasting recognition and his first two Golden Globes in 1974, for Best Motion Picture-Drama and Best Screenplay-Motion Picture. Based on his 1971 bestselling novel, The Exorcist was made into a movie two years and 13 million copies later. It is the story of a 12 year-old girl, played by Linda Blair, who was nominated in two Golden Globe categories: Most Promising Newcomer- Female (a discontinued category, in which she lost to Tatum O'Neil) and Best Supporting Actress-Motion Picture, which she won. The fourth Exorcist Golden statuette went to director William Friedkin, who had won a Best Director Golden Globe two years earlier for The French Connection. Blair's movie mother was Ellen Burstyn, seven times Globe nominee. Swedish actor Max Von Sydow was also nominated. The Academy nominated the movie in ten categories (it won two) but the critics were not enthusiastic. The New York times called it “...a chunk of elegant occultist claptrap". The public however loved the gore (and Blair's spinning head). The Exorcist was a huge hit, breaking box office records and earning over $400 million worldwide. Years later Entertainment Weekly would name it the scariest movie of all time. 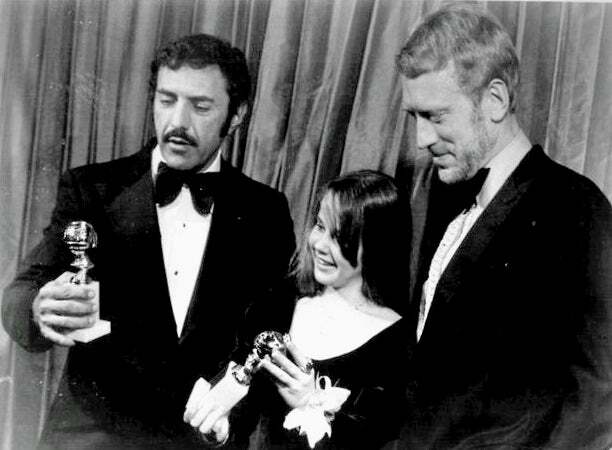 Blatty with LInda Blair and Max Von Sydow at the 1974 Golden Globe Awards. Blatty was not new to Hollywood, but his previous work was far removed from the horror genre. He was an established comedy writer and had collaborated with director Blake Edwards on four features. After the runaway success of The Exorcist Blatty left comedy and stayed in the religious horror genre. “The sad truth is that nobody wants me to write comedy, The Exorcist not only ended that career; it expunged all memory of its existence", Blatty told an interviewer. It was a motivated change. He felt that there was less call for his kind of comedy writing, and it also coincided with the loss of his mother. Blatty's parents were Lebanese immigrants; his father left home when Blatty was six, and his mother raised him alone. They lived on the edge of poverty, moving often when rent money ran out. Blatty attended Jesuit schools, on scholarships. His mother's sudden death in 1967, Blatty said, led him to a closer involvement in his church, and to soul-searching about questions of faith, life and evil in the world. "Like so many Catholics I've had so many little battles of wavering faith over the course of my life" he said. One such tale of faith vs. evil was a newspaper story he once read, while in a Jesuit college, about a priest exorcising a boy "held in the Devil's grip". He never forgot it, and 20 years later it became the basis for The Exorcist. Blatty refused to capitalize on the success of the movie, and write a sequel. But he did continue to mine the same vein. He reworked an earlier novel into The Ninth Configuration, which he again turned into a movie, this time also directing it. He won his third Golden Globe for that screenplay, in 1981. Learning of Blatty's death, horror meister Stephen King tweeted "R.I.P. William Peter Blatty, who wrote the great horror novel of our time. So long, old Bill".